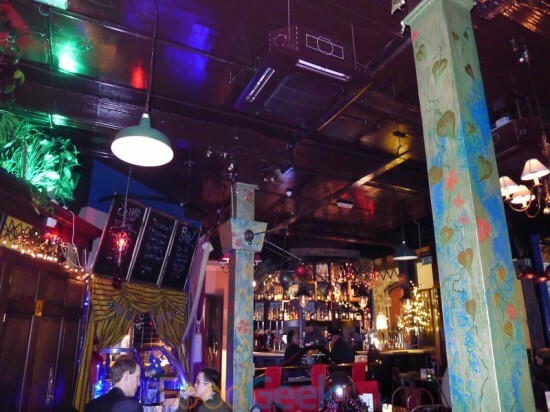 I’ve always liked The Blue Pig pub in Manchester’s Northern Quarter, as a pub anyway. Having enjoyed many drinks there from the impressive cocktail menu to the small but excellent selection of local cask ales. For some reason i’d never eaten there though until last week when I was invited to try the new menu. Other than the plastic plants which i’m not particularly fond of I love the quirky and unique decor which features vintage antiques, original artwork from Manchester based artist Kirsty Almeida and a wall full of framed pictures of pigs! Not only do they sell bottles from my favourite local brewery TicketyBrew but also had their stout, which i’d never tried before on cask. 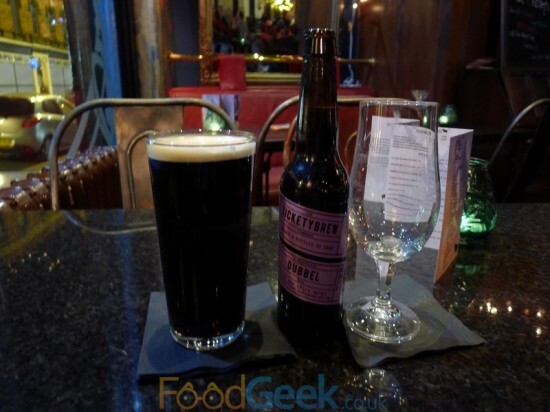 It’s a lovely dark stout which is actually quite light to taste and has that distinctive TicketyBrew flavour. 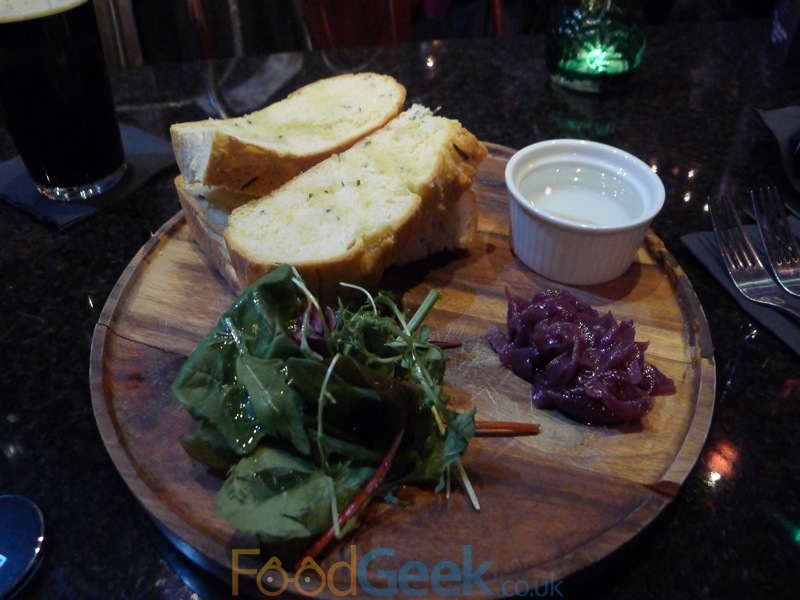 To eat we started with ‘Rosemary & Sea Salt Focaccia’ and a ‘Roasted Red Onion Jam’. The warm, fresh focaccia was excellent and amazing value at just 75p whilst the red onion jam was also really good, warm, sticky with just enough sweetness but not too much. 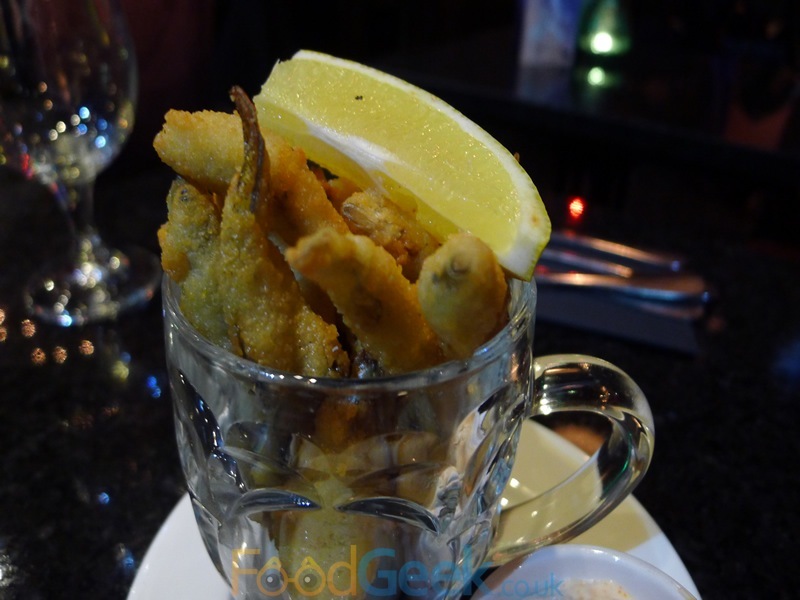 ‘1/2 Pint Of Whitebait’ is a simple but brilliant dish that’s just perfect with beer. Tasty well cooked mini fish in a wonderfully crispy batter, both the accompanying garlic and chilli mayo were delicious with the chilli version having a decent kick. I’d had my main course picked out long before arriving at the restaurant and was genuinely excited to try the ‘Kobe Beef Burger’. Unfortunately it didn’t live up to my expectations, for a start I wasn’t impressed with the box it was served in but I’d have forgiven that had it tasted great…. I found the bread pretty average, especially compared to the excellent focaccia we’d had earlier but the biggest problem was the meat. It was well overcooked in my opinion which didn’t help but it tasted like any cheap ground beef, certainly nothing like the kobe beef i’ve had before. Not that I could realistically expect it to at under £12 but when it’s being sold as ‘Kobe’ expectations will be raised. I think it’s safe to assume that this isn’t actual Kobe beef from Japan, I was under the impression that it couldn’t be sold as such if it’s not authentic but apparently that’s not the case anymore and so this is probably slightly confusing “Kobe-style” beef. 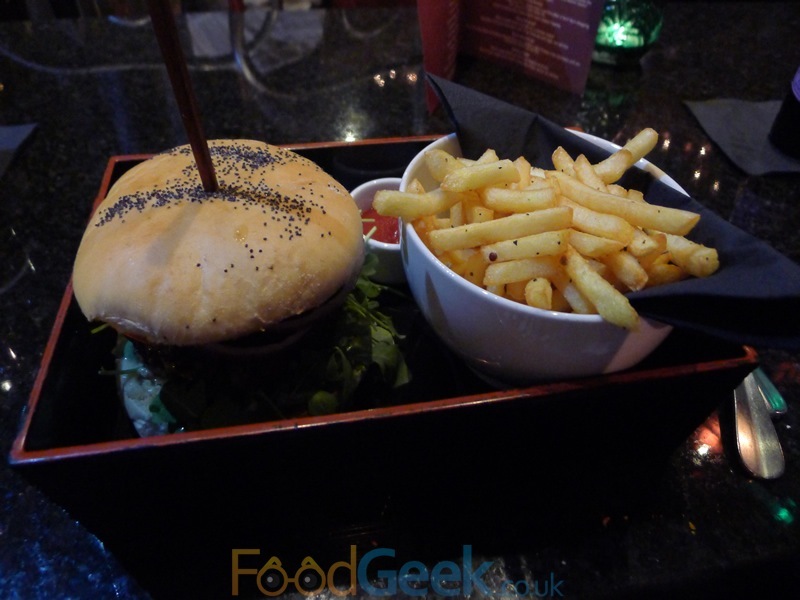 I did enjoy the flavours though, both the smoked ketchup and particularly the wasabi mayo tasted great. Personally i’d drop the Kobe label and just make a good regular beef patty as along with better bread it’d be a great burger. I can’t help thinking they’re missing a trick though, given the name maybe they should create the ultimate piggy burger instead! The fries didn’t look like much but I loved them, nice and crispy, really well seasoned and very moreish. 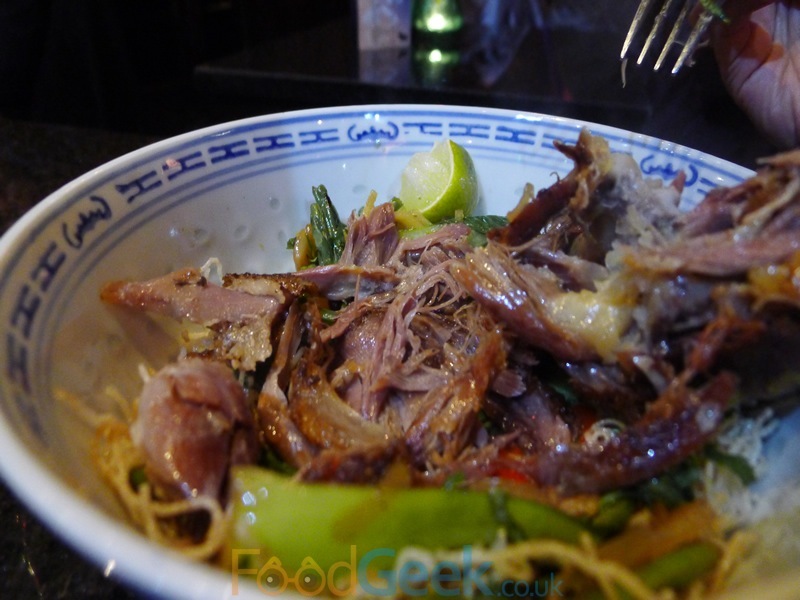 Meanwhile, Mrs FG was having much more fun with her main course of ‘Crispy Duck & Teriyaki Salad’. Don’t be fooled by the word ‘salad’, this was neither dull nor light but a hearty and very tasty dish. 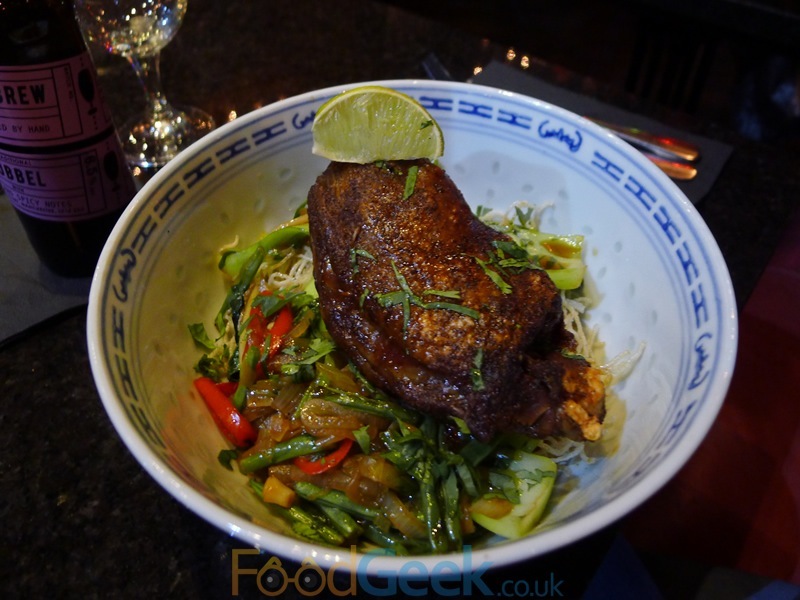 A rather large duck leg had been slowly cooked to perfection, a crispy skin covering juicy flesh so tender it could be shredded with ease using only a fork. Sat upon bed of crispy noodles and stir fried greens including pak choi, spring onions and green beans with a touch of ginger and a good amount of red chilli giving it enough heat even for me! A fabulously tasty dish and an absolute steal at just £8.95. For dessert a generous portion of ‘Churros’ were served with a hot chocolate dipping sauce. Despite being seriously full these were most enjoyable. 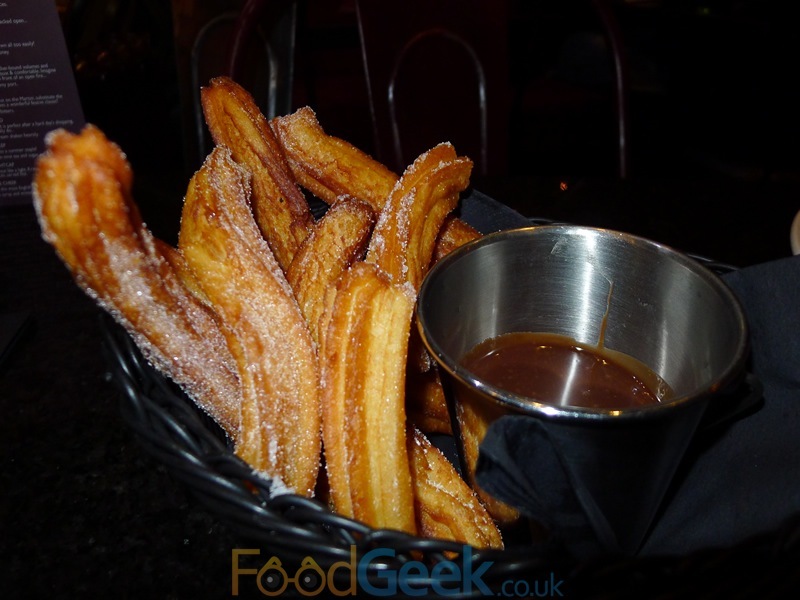 The churros; light, crisp and good enough on their own but just heavenly when combined with the luxurious chocolate sauce. Much better than the version of the same dish I had during a recent visit to ‘authentic’ Mexican restaurant Lucha Libre. 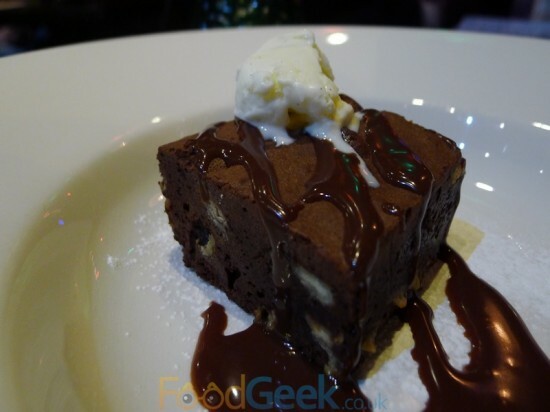 Another indulgent pud, ‘Pistachio & White Chocolate Brownie’ was just as good. Crunchy on top, gooey in the middle, deep chocolate flavour with crunchy bits of candied pistachio, drizzled with warm, rich chocolate sauce and served with vanilla ice cream. 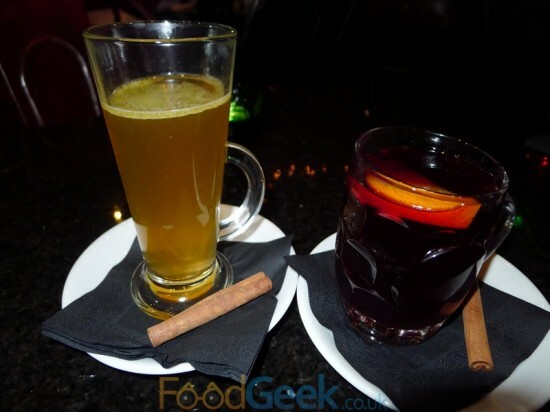 Neither of us could eat another thing but before braving the cold night decided to try a couple of drinks from the Christmas menu. My ‘Hot Buttered Rum’ was a delight; warming, comforting and deeply alcoholic, the perfect winter warmer. Mrs FG enjoyed her ‘Mulled Wine’ just as much and by the time we finished we were ready to face the harsh Manchester weather. 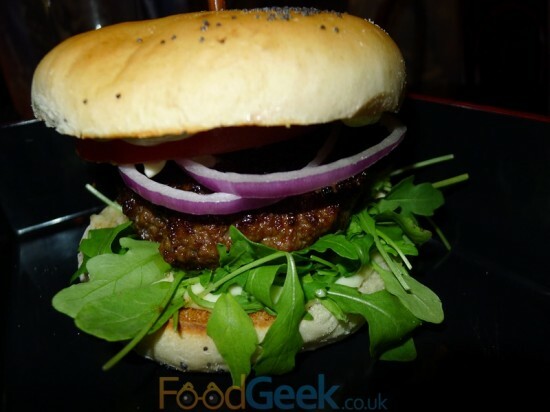 My issue with the ‘Kobe Beef’ burger aside I was generally impressed by the quality of food at The Blue Pig and enjoyed my time there. Service was good as you would expect having been invited but the single waitress didn’t treat us any differently, I watched her be just as friendly and efficient to the other diners. It’s also fantastic value, I don’t often mention prices in my posts as for me it’s not the most important factor when eating out. Usually only if something is particularly good or bad value but it’s definitely worth mentioning here as everything is very reasonably priced. Although I didn’t pay on this occasion I would have been more than happy to which isn’t always the case. Disclaimer: I was invited to The Blue Pig and not asked to pay for my food or drinks but as you can see from my thoughts of the burger this has no effect on my opinions. I’ve paid for drinks there before and will happily pay to drink and eat there again in future. 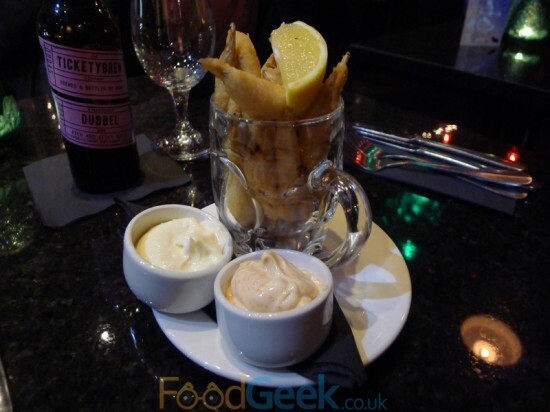 A pint of prawns yes, but fried fish stuffed into a half pint glass, no way. Almost guaranteed to make the coating soggy as it steams inside the small receptacle . And where’s the tarter sauce? Whitebait needs tang to cut through the oil, not kick. 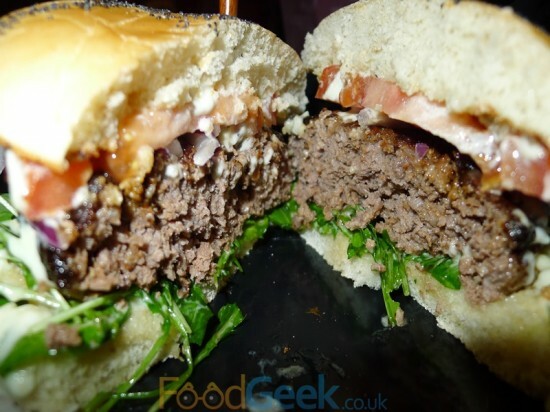 As for the burger it just looks grim, as though made by someone who doesn’t enjoy burgers, the clue is in the rocket, no burger head puts rocket near a good beef patty. As for the puds, well I’m sure they’re all home made, but the Pistachio & White Chocolate Brownie looks almost 3663. So, all in all, I’m glad you went here so I don’t have to. Thanks for the blog by the way it’s always an entertaining read. Thanks for the comments Charles. Can’t argue with your opinion of the burger, such as disappointment. Have to disagree on the whitebait though, it was definitely still crispy and excellent with the the mayos, in my opinion. For £2.95 I’d have absolutely no complaints. The value was the biggest thing I took away from The Blue Pig, the food is decent and certainly far better than i’d expect given the low prices. I’m a stubborn sod sometimes, but I trust your opinion, you’re clearly a chap who knows decent grub when it traverses his taste buds. 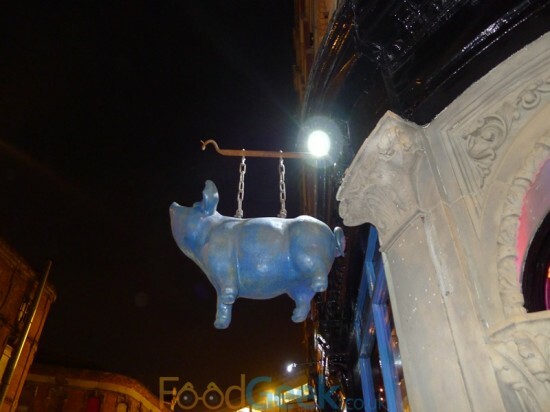 So, I’m going to take a great big bite of humble pie (tastes rank) and I’m going to give the Blue Pig a try. I understand, not that long ago I was pretty stubborn myself. In fact writing this blog has definitely helped me be a little more open minded and tolerant of places I would have written off previously. Don’t get me wrong, The Blue Pig isn’t breaking any boundaries but it’s definitely a cut above many similar places. 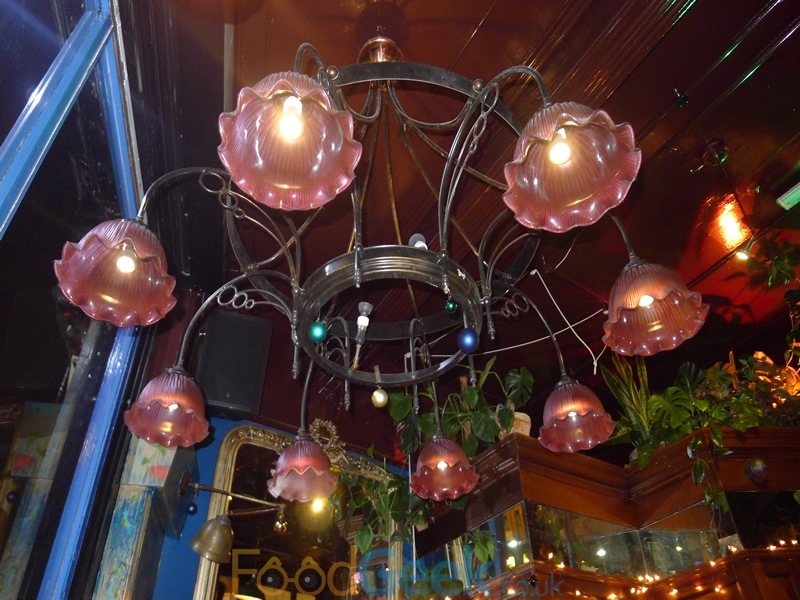 It’s essentially an average pub with above average pub food. They’re clearly making an effort that many don’t and it’s very good value. There’s definitely a place for them in my opinion.